A little crooked. Oh well. The first time I became interested in leeks was when I read the book French Women Don’t Get Fat by Mireille Guiliano. In it, she shares a recipe for “Magical Leek Soup,” which she drank in an effort to get back in shape. The leeks are boiled with salt and pepper, drained, and the liquid is drunk as a broth every couple of hours. It sounded interesting- and the author says her love affair with leeks began because of it- but I merely dismissed leeks as a vegetable I’d never get to cook with in India. But as it turns out, one does get leeks here. Maybe not all the time and at every greengrocer, but you do. And in Pune they are easily available, so I’ve been cooking with them on and off. I attempted braised leeks for the first time a couple of months ago, and both my husband and I enjoyed them. I made braised leeks a few more times after that, and all but forgot about them until I found this poem, A Leek Haiku on Eat This Poem. I am going to make this post short and sweet, much like the inspiration behind it: a haiku. Just 17 syllables, but this poem describes the little leek so, so beautifully. The author calls leeks slender stalks of “ribbons and roots,” and, when you think about it, leeks are quite a pretty vegetable! I think they make a nice sight, the jade green tops peeking out from your shopper as you carry your groceries back home. 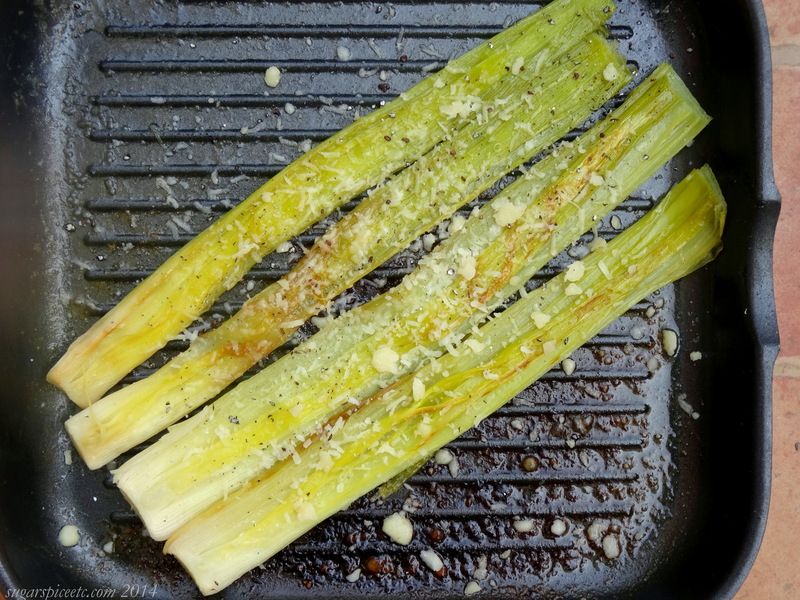 Leeks are full of flavour and I feel braising is one of the best ways to enjoy them- a little fat, some seasoning, and enough water to cook them till they are tender. This recipe is from Marcella Hazan’s Essentials Of Classic Italian Cooking. It takes little effort, and seems almost too simple to warrant a recipe, but it’s simply delicious. Her recipe says, “do not cut off the green tops,” but I had to trim a little because I didn’t have a pan large enough to accommodate. Pull off and discard any withered, yellowing leaves from the leeks and trim the bulbous ends off the roots and the dark green parts of the leaves, leaving only white and light green parts. Slit the leeks lengthwise into two. Wash the leeks under cold running water to get rid of any hidden grit. Lay the leeks in a pan long and broad enough to accommodate them. Add butter, salt and enough water to cover the leeks. When the leeks are done, remove the lid of the pan, turn the heat up to high, and boil away all the juices in the pan, allowing the leeks to get lightly browned. Add the grated parmesan, flip the leeks over to coat, and serve. I’ve made this before and it’s amazing! I thought it would be neat to cut the leeks after cooking into long ribbons and use them as noodles, somehow. sounds really yummy meenakshi…… and here I thought leeks were best for soups ONLY…….. Thanks for sharing…… shall try it out….. only problem difficult to get leeks where I live…… and when we do get them, the leeks tend to be wilted and stringy ! !